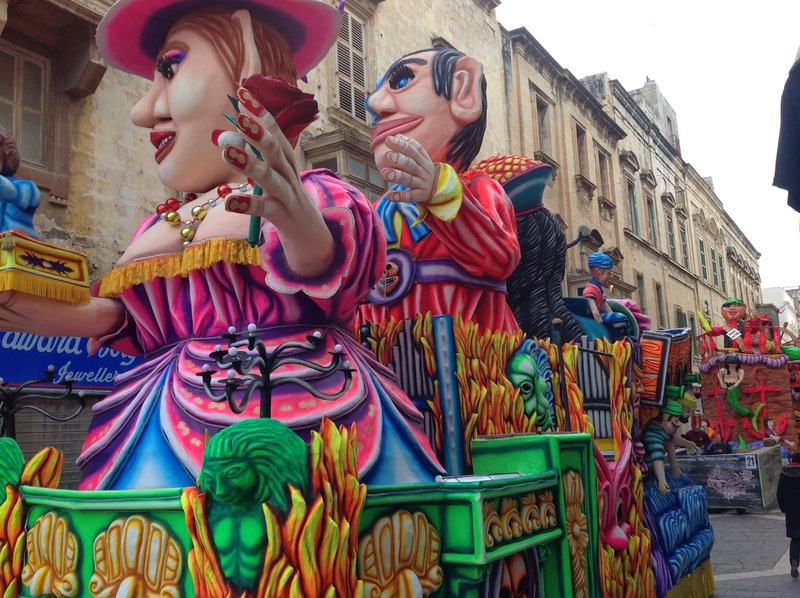 I just got back from a very restrained celebration of Carnivale -- or, as we call it back home, Mardi Gras or Shrove Tuesday. 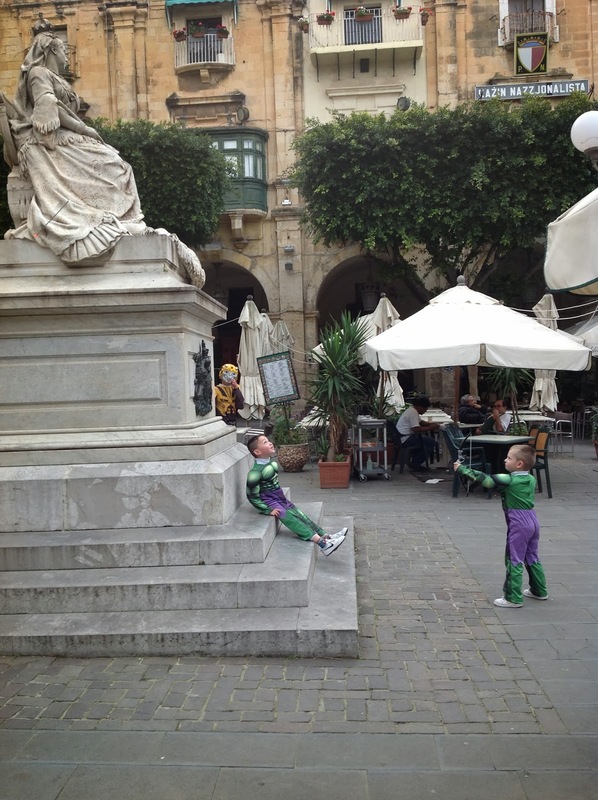 I returned to Rome from Malta yesterday, and had some errands to run. Today I had some adventures with Fed Ex -- or, to be more accurate, with whoever Fed Ex works with here in Italy. To make a long story short, I had to stay close to home while I waited to see if a package I was expecting would arrive at the Vatican so we could pick it up. It did; but it was touch and go. So this evening, I was with the group of priests who, like me, are on sabbatical, for a talk by American author and theologian, George Weigel, whose promoting his latest book, Roman Pilgrimage: the Station Churches. After that, and evening prayer, we had a happy hour, then dinner; dessert involved a Roman tradition: sweets with sweet wine, for Carnivale. That was my Mardi Gras (unless I sneak back out for a bite before midnight!). 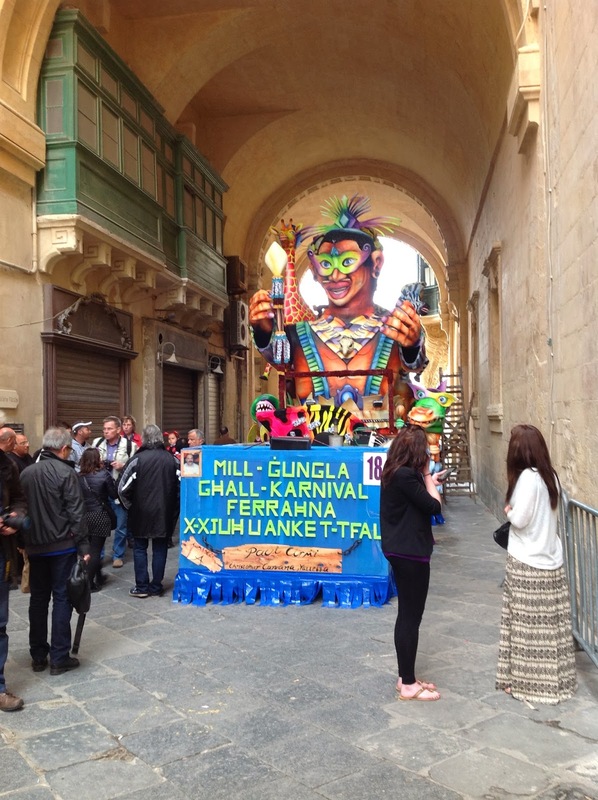 Meanwhile, let me tell you about Malta's Carnivale. I'd learned that the more or less "official" kick off of Carnivale was Friday evening, in the capital. I want to say "downtown," but in a way, the entire country -- being a not-very-big island -- is really like one big city, with some big open areas. But that's not how the Maltese seem to think about it. 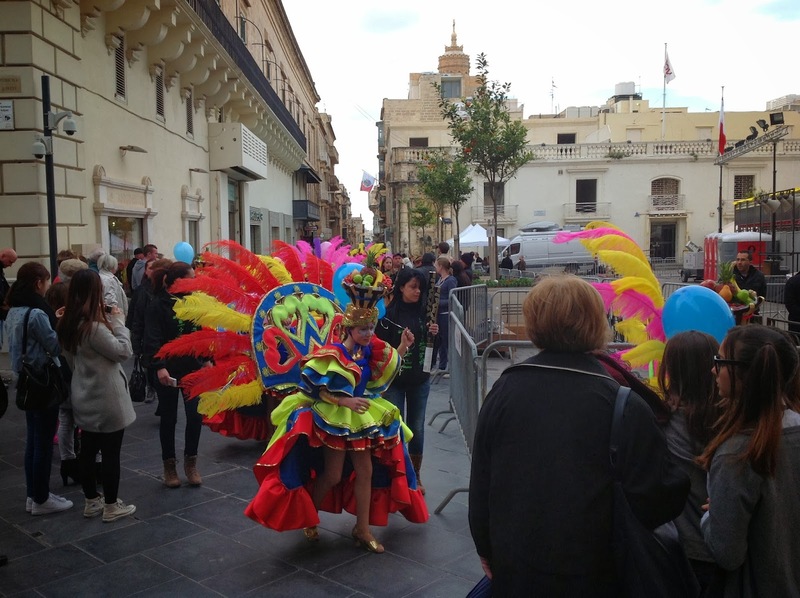 So, Friday afternoon, I headed to Valleta; figuring I'd see the festivities, then get a good meal. As you might guess, it wasn't that simple. The streets were lined with food booths, just the way we'd have a downtown party. And in Republic Square, in front of the Parliament, stands were set up for some kind of show. I think I explained already that a police officer told me, that was where the dancing was going to be presented. So here's how it works. Any number of folks organize dance teams -- maybe something like the "krews" in New Orleans -- and they prepare, I don't know how long, for this event. 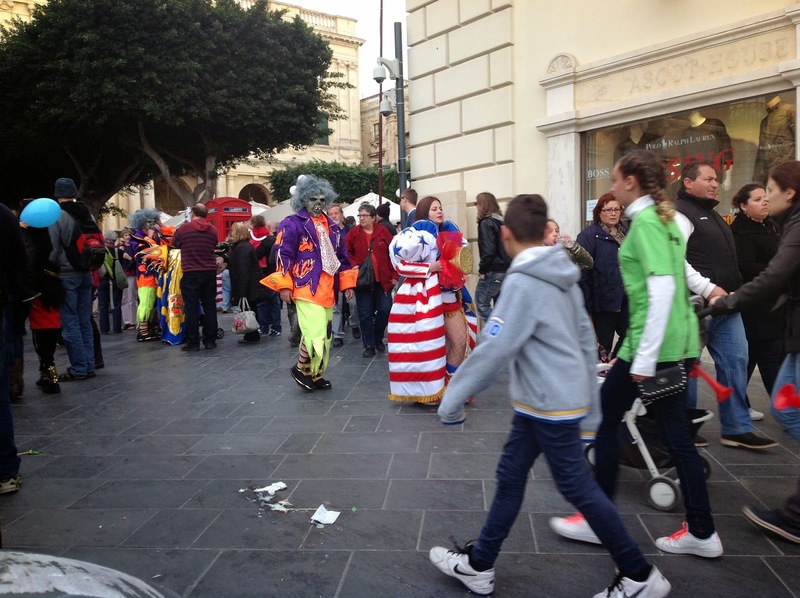 That became clear to me as I saw the groups showing up with their very elaborate costumes. Altogether, I think there were eight or ten dance groups that performed Friday night. Here's a line of one of the teams coming through the crowd. This group was mostly kids, but other crews were mostly adults. One was various folks with disabilities. Here's a mostly adult group that had an Egyptian theme. I was too cheap to buy a ticket, so I couldn't see much of the dance routines from my free perch; but this group looked pretty good. Here are some other folks going by. The ladies had some kind of Old Glory theme in their dresses. I couldn't really figure it out. And...there were floats! I took these pictures way before the party began; when these bad boys finally made their debut -- after all the dance presentations -- it was dark, and these things were lit up, and had moving arms and heads. The friendly Italians who ran the place invited me to sit outside -- I think they wanted me to help advertise they were open -- but were fine with me ducking my head out occasionally to watch the progress of the Carnivale. What? You don't recognize him? 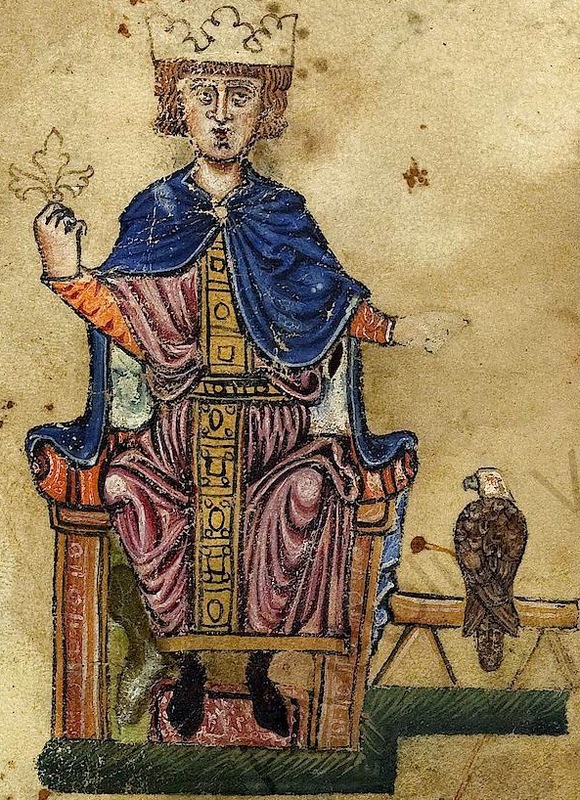 That's Frederick II, Holy Roman Emperor, one of the most powerful and impressive; hence the name Stupor Mundi, "wonder of the world." Equally impressive was having the restaurant owner explain all this to me. I didn't know much about him. If you want to read more, see this. After my meal, I decided that was enough Carnivale, so I headed home. 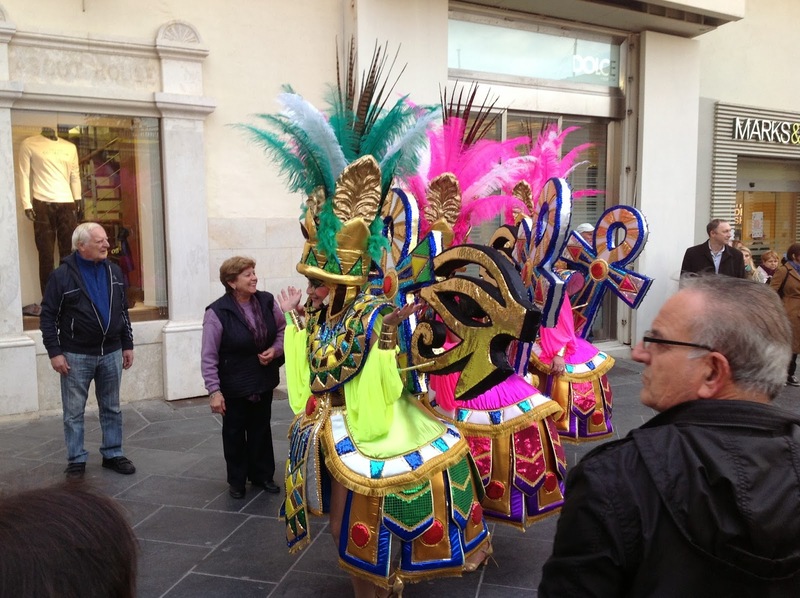 As I write this, I'm in Rome; tomorrow is Ash Wednesday, hence the name Carnivale, which means, "say goodbye to meat" (back in the day, you gave up meat for all of Lent. So stop complaining about how hard it is!). I'll be in Rome for Ash Wednesday, then on Thursday, I make my pilgrimage to Germany, the land of my forebears. Then I'm back in Rome for about four more weeks, then home. Stay tuned to this channel for more exciting adventures! Wonderful story, Father! I look forward to more. 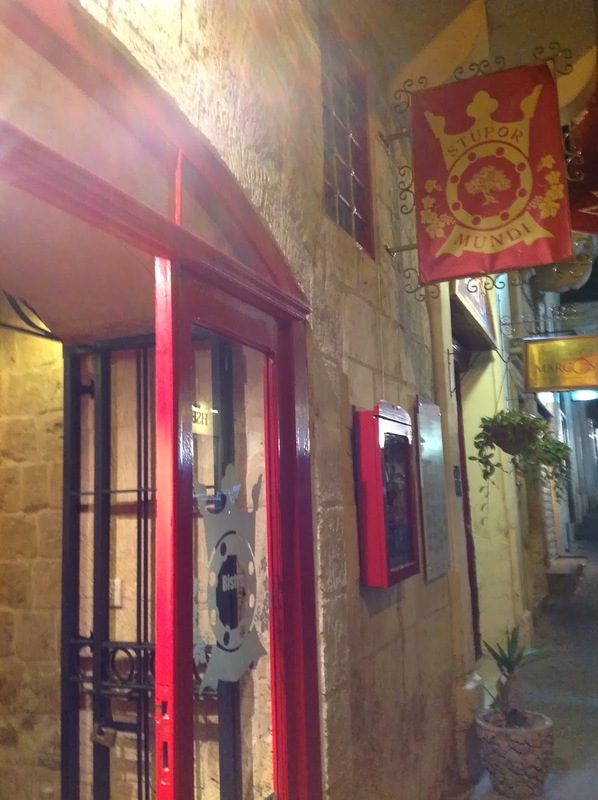 I am going to visit Jerusalem for the first time in May, so I am working my way through your travel posts. Thanks!